My short time in Honduras has come to an end, but I have been privileged to be a part of several struggles of life-changing importance for Honduran people both at local and national levels, as they fight against the corruption and injustice in their country. I have been able to maintain contact with COPINH and their partners, and here I finish my blog series with an update on 2 of the main issues that I have been following. The San Juan farming cooperative’s continuing struggle for their land and the national Indignados anti-corruption movement continue to move forward, and they provide an excellent overview of the issues facing Honduras and how they fit together. I visited San Juan several times, and stayed with the farmers of a co-operative that have faced intimidation, sabotage and murder for their attempt to protect their farmland from private sale. As I reported on the 3rd of July the 26 families in the coop had been usurped from their land by the Rios family – previously part of the coop and supported with money and guns from Mario Pérez. Pérez is the Secretary of Congress, high in the corrupt national government, and has designs to buy the land to add to his private estate. The Rios have maintained a campaign of intimidation, and on the 20th of May they attacked the coop and shot dead Moíses Durón Sanchez. The men of the coop have settled on the parcel of land, to prevent it from being taken back by the Rios and to turn it into a productive source of food and economic independence. When I first visited them, they had found their drinking water supply sabotaged with machete cuts and stolen parts, and we went to the local city of Santa Barbara to file a police report of this crime, and chase the public prosecutor in the ongoing case of Moisés‘ murder. The day seemed a success – despite a history of indifference to the small community’s problems, the police and public prosecutor made promises to arrange visits to collect evidence for both cases. This may have been helped by the presence of myself and another COPINH volunteer as European observers. As I reported on ENCA’s Facebook and Twitter feeds on the 6th of July, when I returned a second time I found coop leaders Abener and Melvin Jimenez disheartened – none of the authorities’ promises had been fulfilled and they seemed to have gone back to ignoring them once the pressure was off. Last Saturday – the 12th of August – I talked to Abener and Melvin on the phone and was pleased to hear that the week before the police had finally come to take photos – the cases are at least moving forward. A COPINH land rights lawyer has their case as one of a great many that he is trying to help with. 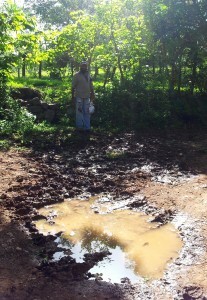 But progress is very slow, and the coop has suffered a severe setback with their first anticipated crop. A very dry summer has killed off the maize and yucca that was just sprouting as I visited. On top of the ongoing threats from the Rios, the coop are still in an extremely precarious situation, without the food or income they were banking on. They are now preparing for the next planting season, while looking for cattle ranching work when possible to supplement their income, and Abener and Melvin were asking COPINH and their local town halls for food donations. Talking to Melvin, I admired his positivity and the resilience of the coop members. When I was there they had been working non-stop to convert all the previously neglected and overgrown 60 hectares to growing space. At night they were sleeping in shifts in palm-roofed tents and open-sided cabins to be alert for attacks. Melvin told that they’ve started building more permanent housing on the site. Using earth from the site to make adobe bricks, he told me they can make a tiny house in a week. The coop is fiercely determined to stay and defend their rights to land and an independent livelihood. San Juan’s struggle has been paralysed by the apathy and disregard of their local police and public prosecutor. The Honduran police force is widely regarded as corrupt and ineffective, and in Santa Barbara is under the influence of Mario Pérez’s power. Meanwhile, since the military coup in 2009 and the break down of local economies and the job market, violent gangs and drug smuggling has proliferated in Honduras. The government has used this to justify deploying the military as civil control. While crimes against poor campesinos are ignored, machine gun carrying soldiers are now in every town engaged in controlling protests, carrying out evictions, and protecting big business operations. After the coop took back their land, the Rios arrived to take the cattle that they had been rearing there – and were escorted and supported by a squad of soldiers. The militarisation of the country has become a tool for the corrupt oligarchy – a few rich families and their business and government links – to supress human rights and social organisations that get in their way. In this wider political context, Melvin told me that the best news for the cooperative was not local but national, in the advances being made by the popular “Indignados” protest movement. As I reported previously, this new movement ignited in the weeks just before my arrival in Honduras. The spark was evidence that President Juan Orlando Hernández’s ruling National Party had received money from a multi-million dollar fraud against the healthcare system, which resulted in thousands of deaths. Tens of thousands of people have been marching every single Friday since then demanding an end to the country’s corruption, and Hernández’s resignation. 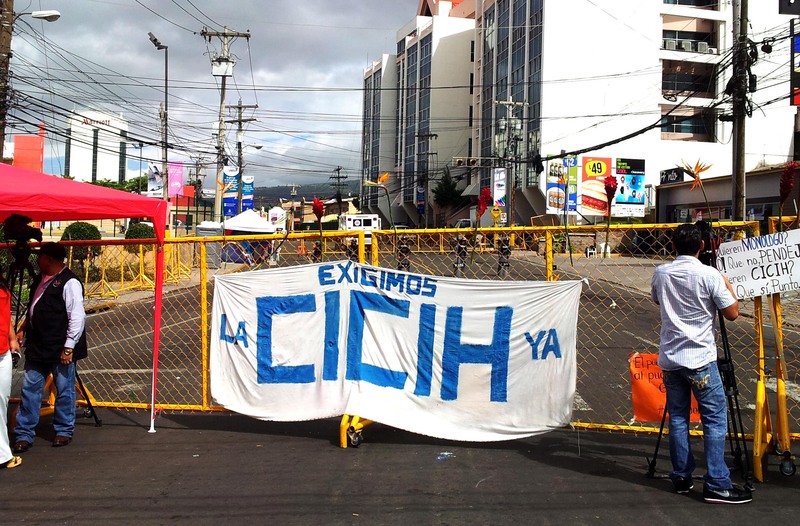 While in Honduras I visited the capital Tegucigalpa several times with COPINH to support Indignados marches, and visited a camp near the Presidential House where dedicated protesters had established an Indignado hunger strike. This Saturday I talked by Skype to 2 important members of this strike. Ariel Varela had been one of the first hunger strikers, and has since become involved in a political part of the Indignados movement. German Ayala started a few days after Varela, but became the longest running individual on the strike, and remains heavily involved in the Indignados’ grassroots organising. 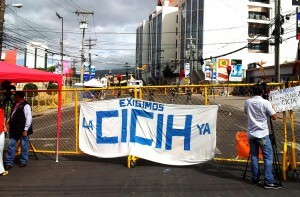 The Indignados’ demands have always been for an independent International Commission against Impunity in Honduras (“CICIH” in Spanish), a demand that requires support from international bodies like the UN and Organisation of American States (OAS). The very day I talked to Ayala and Varela, a new OAS delegation had arrived in the country. The OAS Secretary General Luis Almargo presented Chilean lawyer John Biehl del Río to act as facilitator in the political crisis. After a fact-finding visit in July, the UN have now also agreed to send a facilitating team, due to arrive on August 17th. But the ongoing issue – as I wrote on on the 7th of July – is whether these international efforts will manage to stay independent from the systemically corrupted legal institutions of Honduras, and the influence of the president. His response to the Indignados so far has been to initiate what he calls a “National Dialogue”, supposedly to hear and find non-binding bases of agreement with the Indignados and civil society organisations. The protesters consider Hernández’s “dialogue” to be beholden to and directed by him, and deeply entangled in the corruption it claims to tackle. With this tangle, they have refused to step into what they consider a sham process, and are holding out for the more radical CICIH. The biggest worry is that Hernández could use his rather empty dialogue to side-step opposition, by claiming that those that refuse to “dialogue” are refusing to help come to a resolution. According to newspaper reports on Saturday, in del Río’s opening address to the Hondurans he stated how important it was for all sides to come into the dialogue, which isn’t reassuring in this regard. According to Varela though, who was among the first group to talk to the OAS delegation, del Río and the others seem to understand the ubiquity of corruption in the Honduran political and justice system, and the demand for an independent CICIH. German Ayala told me that the Indignado hunger strike finally came to an end a week before on Friday the 31st of July, after more than a month some of the participants. At the same time the group announced the formation of a National Indigado Board, to de-centralise the movement. The decision was mediated by Wilfredo Méndez, the director of CIPRODEH – the Honduran Centre for Investigation and Promotion of Human Rights. Méndez had become closely involved in the strike, but also brought the dissolving strikers an invitation to the Dialogue process. According to Ayala however, the strikers have remained skeptical and few if any of the Indignados movement have joined Juan Orlando‘s process. Their interest is in maintaining the momentum and engagement of the protest in the broader population, and the demands for a genuine process. 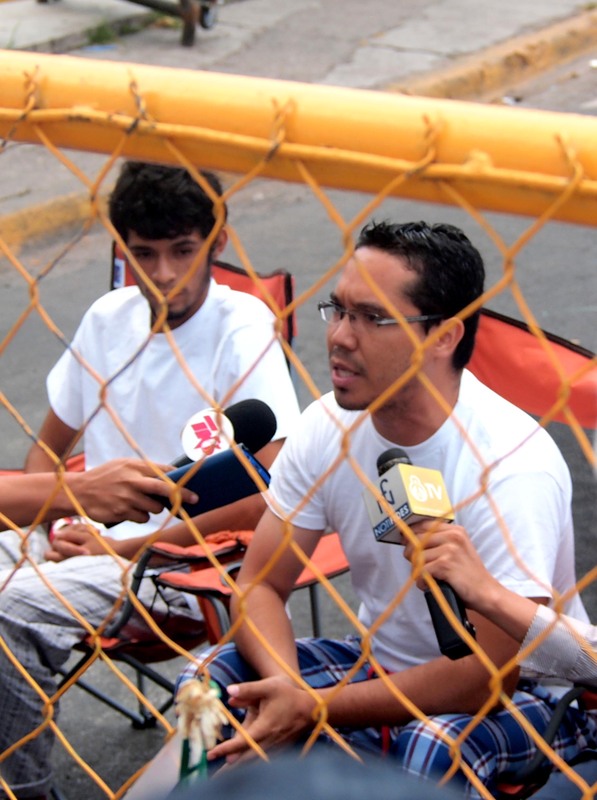 The hunger strike now continues elsewhere – with new groups now striking in the smaller cities of La Ceiba, Santa Barbara, Colón and San Pedro. A Light at the End of the Tunnel in Honduras? The international delegations from the Organisation of American States and the UN represent the success of the popular Indignado movement in bringing international attention to Honduras’ crisis. The pressure may be starting to tell now on Juan Orlando Hernández and his government. In a statement on Saturday Hernández affirmed that he would follow whatever the results of the Dialogue are, and for the first time conceded that this could include a decision to invite and install a CICIH. The presence of the international groups may be forcing him to demonstrate the potential for genuine negotiation. Then, this Monday the 10th August, the President of Honduras’ Supreme Court of Justice, Jorge Rivera Avilés also came out in support of a CICIH or similar international process as the solution to the problem. These small statements may finally show a light at the end of the tunnel for the Indignados – maybe even of the long dark tunnel that Honduras entered with 2009 coup. 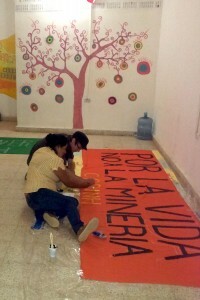 Organisations such as COPINH who fight against the repression certainly hope so. Hondurans such as Melvin and Abener Jimenez hope this light will herald a break in the corruption that blocks their aspirations and keeps them in poverty and hunger. But so far it remains only a tiny light – a glimmer in the distance. Derailment is still a strong possibility for example through political decoys such as a vassal “Dialogue” process. Until now, this word has become redefined by Hernandez’s agenda to mean “Monologue” – a process managed to preclude any real dissent or progress. This Orwellian co-opting of the political vocabulary may bring the OAS and UN their biggest challenge – taking the word “Dialogue” back from Juan Orlando and redefining it again as a truly independent process that the Honduran people can trust. If they don’t do this the delegations risk finding an impenetrable barrier of understanding between themselves and the people. My main aim in writing this blog has been to bring some of the struggles I have seen in Honduras to international readers. 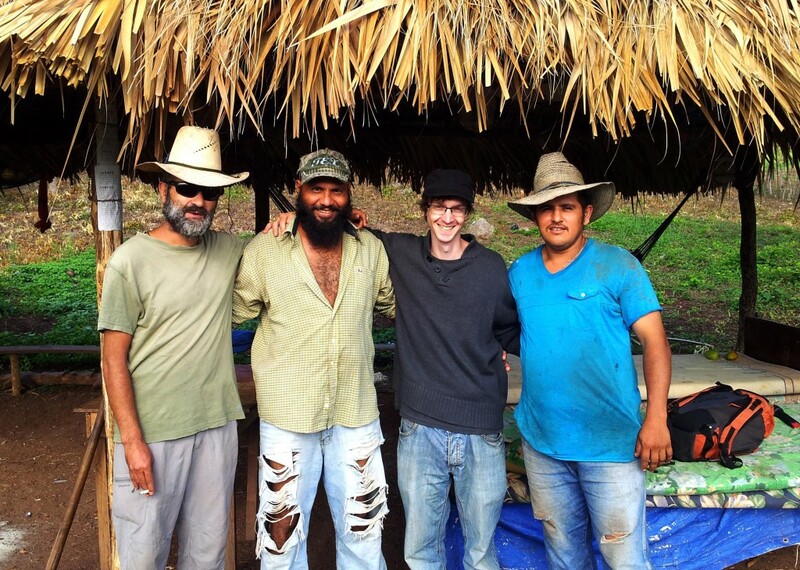 Just as the indigenous, farmers and the poorest are marginalised within Honduras, Central America in general tends to be marginalised and disregarded in the consciousness of the developed world and our media. As with many of the issues I have discussed in this blog, San Juan’s cooperative’s complex problems can be seen in terms of both local struggles and much broader national and international contexts. San Juan and COPINH in general face a profound lack of resources, political interference and exploitation by the rich, and racism and indifference from the police. The oligarchy protects themselves against resistance to this state of affairs with violence and corruption that further oppresses the poor. Meanwhile, the oligarchy’s international business and government relations supports them materially and ideologically. Presenting themselves as the bearers of economic “development”, their repression and inequality ensures the benefits flow to them alone – further marginalising the rest of the country. I hope these articles have helped to show just how complicated and interwoven the barriers to true local development and empowerment are in this corner of the “developing” world. International support is still needed to maintain the pressure on the UN, OAS and Juan Orlando Hernández, to help Honduras achieve real change. Please visit our Act Now page and see how to join our petition in support of the Indignados. 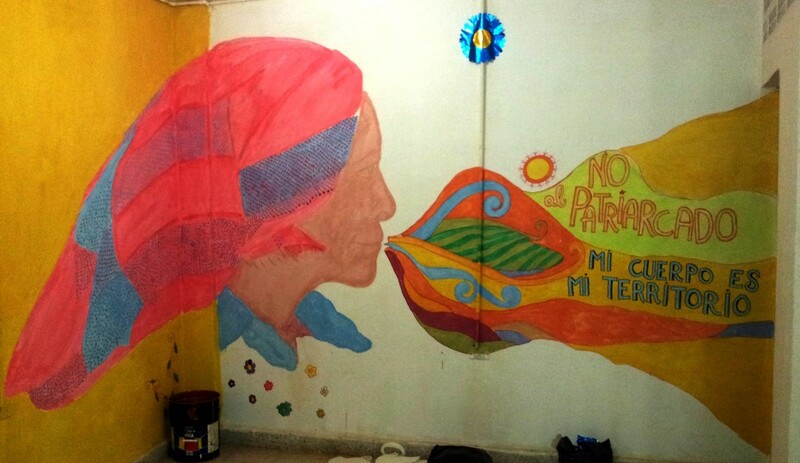 And to stay connected to the struggles in Honduras and the inspiring voices from the region, please consider becoming a part of the solidarity network ENCA – the Environmental Network for Central America. For a tiny £8 per year you will receive our four-monthly newsletter – a rare source of English-language news from this inspiring area. Thank you for reading!